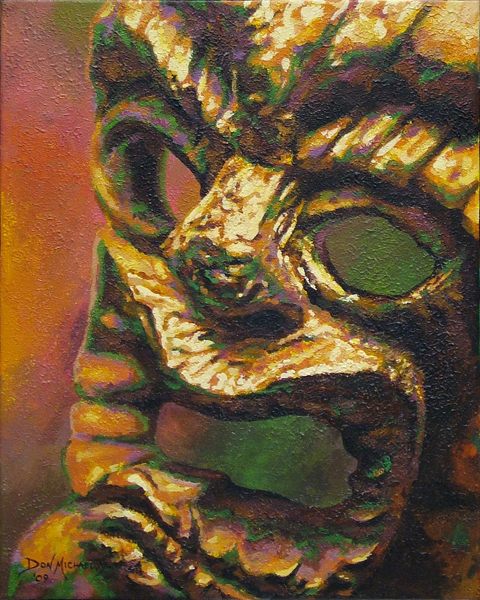 For those of you keeping score at home, this is the 100th painting in my mask series. I knew I was getting close and took a “head” count a couple of weeks ago. 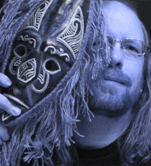 I already had designs for my next few paintings at the time and knew which order they were going to be attempted – so this particular mask was not necessarily chosen for this honor – he just happened to be the next in line at the right time. When I mentioned to my friends CJ and Carla that I was working on my 100th painting they suggested I name it One Hundred. Not wanting to be quite that obvious, I started dwelling on derivatives of 100 for a couple days until the word “Centurion” came to mind. I went to the dictionary and knew right away I had the name. In the Roman Legion, a Centurion was the leader of a Century – or 100 men (it was later revised to 80 men). While a few assholes are laughing all the way to and from the bank the rest of us are hanging on for dear life hoping to ride out the current economic storm. Once again I textured the heck out of the underpainting on this latest work with my natural sponge and a light modeling paste. I then used several flat bristle and sable brushes to bring out the composition. 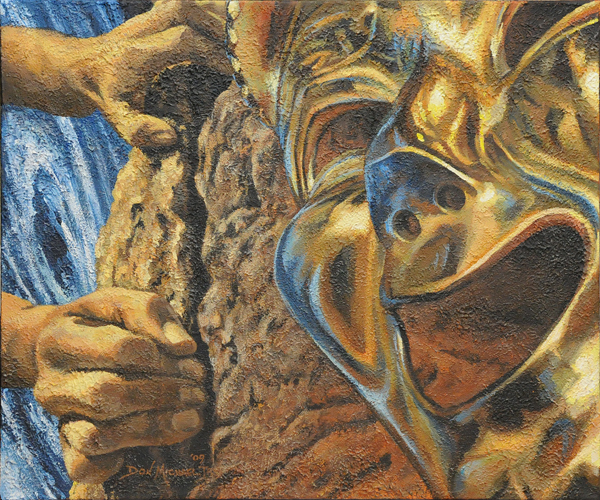 The texture made painting the details in the hands and mask quite a challenge, but I needed such to get thru the angst I was feeling as I created this one. I’m keeping this post short and letting the image speak for itself. I hope my pissedoffedness shows thru loud and clear. People experiencing a big city for the first time have every one of their senses stimulated in new ways. The lights, the tall buildings, the cacophany of sound, the smells and the seemingly limitless things to do all create a sense of awe. I try to keep that feeling when I go to The Strip here in Las Vegas, as well as when I travel to other cities. I still look up – I don’t care if local snobs then associate me as a tourist. There’s too much to see and experience to let their preconceived notions affect my enjoying the sights and sounds. I love a bustling, living, breathing city. You might even say I’m “Enamored” of the city. In my most recent painting I wanted to express that sense of the first moment of experiencing a city. The highly reflective surface of this Venetian mask was a perfect fit with the suggestion of lights in the background. 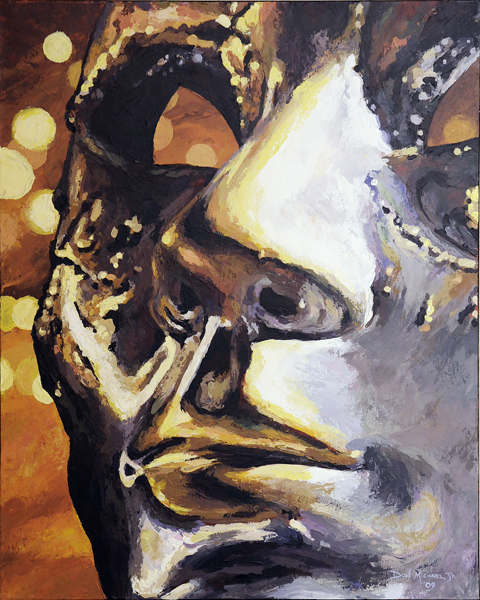 Choosing a low angle point of view for the mask gave me the opportunity to make it appear to be looking up. 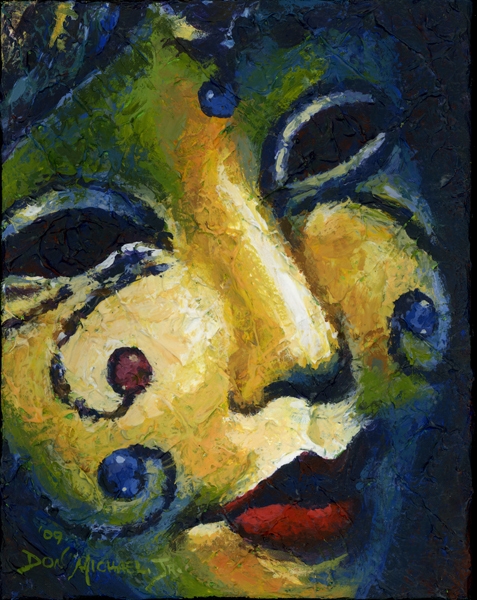 It’s a fun challenge to create the illusion of these eyeless masks “looking” in a direction. As I painted the background I made sure to angle the strokes and colors to create a feeling of motion and energy. In search of new ideas, I recently did an online image search for Greek masks. I happened upon the Flickr.com account of Mary Harrsch who has posted several wonderful photographs of masks and sculptures from museums she’s visited over the years. One that specifically caught my eye is of a Greek or Roman bronze handle attachment in the form of a mask portraying the god Dionysus. I contacted Mary and she gave me permission to use this image for reference as long as I gave her credit. I consider it an honor to do so. Thank you, Mary. As fun as it was to paint, this ended up being one of the most difficult of my paintings to title so far. 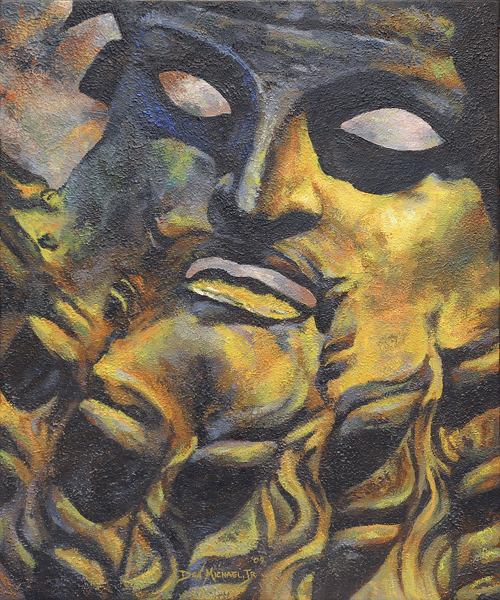 The expression of the mask is so stoic and strong that I wanted the title to reflect this. The colors are so rustic that I wanted this reflected, as well. I wrote down words like Incorruptible, Strength, Tempest, Change, Resolute, Long-suffering and Odyssey. As I went over these thoughts with my wife, she mentioned that the mask made her think of a fatherly figure or a king – someone who’ll take care of any situation. So, it was back to the studio with my Thesaurus, two dictionaries and two books of quotations. After several hours I came upon the quote by Persius that goes, “He conquers who endures”. I had found my title… (I also would like to mention I’m reading “John Adams” by David McCullough which helped to inspire the thoughts of incorruptibility and strength of character.) Anyway, I hope you enjoy.